We hiked the Gross Piton Volcano today. Cost was 30$/person and then add a generous tip if the guide is good. Our guide was Margaret and she was very patient on this trip. Average round trip usually around 4 hours with stopping points at 1/4, 1/2, 3/4, and the top. My husband, myself, and grandson made this trip in 7 hours. We are both 63 years old. Husband not in shape unfortunately. Our 13 year old grandson is a total athlete, who could have made it in less than 4 hours. I do cross fit and for this trip I added stair climbing which was very beneficial. My mates were very impressed with my climbing abilities as I was also. It was grueling for my husband. He was on antibiotics, and his toes hurt on the way down to the point of extreme pain. He drank about a gallon of water a few boiled eggs and an energy bar. Not enough carbs. Ended up weak, but his determination to complete this hike was awesome. The guide, Margaret is very strong and helped pull him down some of the very steep terrain. She was very concerned for him and gave him her fruit drink which helped some. Had our grandson run down the last 20 minutes for some energy drinks so that he could finish the trip. Bless his heart, he also carried his Papa's backpack along with his own. It was an experience we won't forget and he said he actually had fun when it was all said and done. Although, during the duration of the trip, all he could think about was how he could complete this. I think he would have paid for a helicopter ride back if it were available. Tip these guides generously if you take longer than the average 4 hours. She had no idea what she had gotten herself into. LOL. We both had lots of leg cramping on the way back to our hotel 2 hours away and had to get out and walk them off. Impression: Very steep terrain after 1/4 up and continues to get more treacherous to the point of analyzing where you place your feet for safety. Bring lots of carbs, water, fruit, energy bars and bug spray for mosquitoes. With determination, encouragement, and a patient guide, almost anyone can do it. Being fit is a big plus. 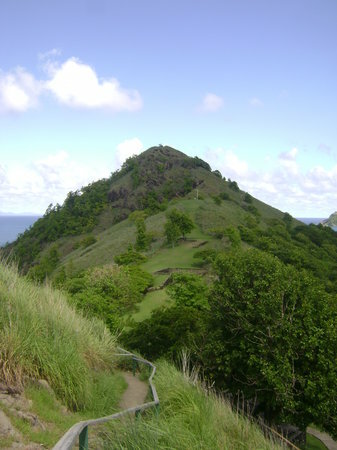 We knew the one thing we wanted to do while we were in St. Lucia was climb Petit Piton. After much research we decided we wanted to challenge ourselves and take on the "smaller" but much more difficult Petit. There is nothing Petit about the climb. It was the hardest thing I have ever done but the feeling of accomplishment when we reached the top was amazing. You definitely need to be in relatively good physical conditioning. Most of the climb is at at least a 60% grade or steeper. There are no handrails but there are primitive ropes at some of the steeper parts. There is no welcome center or anything fancy. We hired a local guide at the base of the mountain, Andrew, who was fantastic. We felt very safe with him. He let us set the pace and took video along the way. Good climbing/hiking shoes are a must and of course, water. 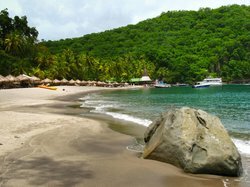 There is always a nice breeze in St. Lucia which helped with the heat. It took us about 2 hours to go up and about 2.5 to come down. 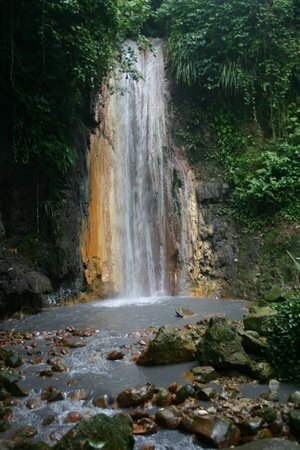 Next time we go to St. Lucia we will be doing the climb again. We're staying in a hotel with views of the impressive Pitons and decided that we'd like to try the Gros Piton Hike. At $95/US each the hotel's planned excursion seemed very expensive given that we knew the fee for using the trail, a fee that includes the cost of a guide, was $30/US each (about $80/EC). We had a hire car (a 4x4 Suzuki Jimny) so decided to drive to the village of Fond Gens Libre ourselves. It is well sign-posted from the main road south of Soufrière and the road there is very good by St Lucia standards (though there was one rough ford). A few km down the small back road you make another sign-posted turn at a small bus stop and follow the lane for a very short distance before turning left and steeply up into the village. Parking is haphazard, but we were directed into a space. A guide then introduced herself, quickly addressing our concerns about how difficult it would be to get one without having pre-booked. She led us up to the interpretation centre where we paid the fee. Within just a couple of minutes of arriving in the village at 8:30am we were off up the trail. Setting off early helps avoid the worst of the heat, and the route is pretty well shaded, but even so our guide checked that we had at least 1.5L of water each. It is hard work, but the pace was fine and the guide was happy to let us set the pace on the steeper sections of the route. The path, especially beyond the half way point, contains a lot of steep and uneven steps up rocks but is well made and has handrails on the steepest sections. With just the two of us plus the guide in our group we made good progress. Apparently our guide has done the uphill leg in 38 minutes on her own, but we took just over 1 hour 20 which she regarded as very quick. I believe that 30% of people don't make it up, and indeed we saw someone who had decided to stop at the half way point (which has a nice view of Petit Piton). The view from the top wasn't quite as good as hoped, mainly due to cloud and haze. 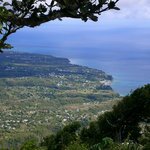 You can't see 360 degrees, there isn't really a view north to Petit Piton, but you can see inshore as well as south to St Vincent. We definitely felt a sense of achievement getting to the top (and back) though, and thought this was a very worthwhile way to spend the morning. After a celebratory snack at the stop we set off down, which took us about as long as the ascent. We were back down and in the souvenir shop less than 3 hours after setting off, but depending on your level of fitness you may take longer. In addition to water, and maybe high energy snacks, you will want good shoes. Our guide said that the trail opens at 7am and they stop taking people up at 2pm. We hiked Gros Piton on March 12, 2014, on the advice that the pamphlet said Oprah Magazine said "It's on the top 5 things you must do in your lifetime". So we were thinking that this is something so extraordinary, that we just had to do it or we would regret it forever. Sorry, but my opinion is it's not even on the top 100 things you must do in your lifetime. It's an EXTREMELY hard 4 hour hike over huge rocks and steep terrain, and getting down is just as hard. We thought we would be able to see a 360 degree view of the island, but that's not the case. The view is definitely not worth the effort of the serious, sweat induced, labor intensive, heart attack experience. You can basically see the same thing out the airplane window when you fly in . Maybe it's because I live in the Mountains, and I have the privilege of seeing beautiful scenery every day. Good hiking shoes are a must, and a back-back is highly recommended with at least 1-2 liters of water per person. You have to pay a guide $30/US per person to take you up, and you can't really go at your own pace. 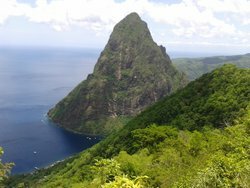 The Pitons truly are a beautiful sight and St Lucia is a mecca of breathtaking scenery... but my advice, appreciate them from a distance, they're just as beautiful! 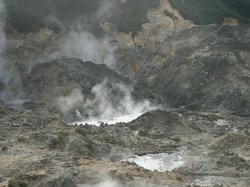 A must see when visiting St Lucia! We ate at a restaurant with the Pitons in view. The topography of this area is simply amaxing.